Want to know which is the best dash cam? Well, good news, we've tested dozens of dash cams to find the best, and give you the most reliable recommendation out there. There's also a short answer and a long answer, so strap in and come along for the ride. The short answer is that the Garmin Dash Cam 55 is the best dash cam you can currently buy. A 2.0-inch screen on the back of the dash cam enables you to instantly play back video on the camera. As well as high-quality video, it records detailed time and location data with GPS, features a good smartphone app, and has extra features such as forward collision and lane departure warnings. All-in-all, it's a very compelling dash cam package! The NextBase 612GW is a very close second, offering superior image quality to the Garmin, but in a chunkier design, or, if you're looking for an invisible dash cam, which sits discreetly behind your rear view mirror, check out the Thinkware F800 or Mio MiVue J60. If you're looking for the best budget option, try the Mio MiVue C330. The long answer involves how you plan to use the dash cam, what specific features might be useful to you, and different options to suit your budget. You want at least 1080p recording, 720p doesn't quite cut the mustard, and while 4K is a nice option to have, the file sizes are very large and older computers will struggle to play them. Next, you'll have to decide whether you want a dash cam with a screen, or a model without. Dash cams with screens are easier to set up and view footage on, but ones without screens are a lot less intrusive. Both are useful, but we'd choose one with a screen for occasional recording (track days and scenic drives), but one without a screen setup and forget about for everyday driving. Mounting type is also important. Most stick on the windscreen with a suction mount, the same a sat nav, whereas some more permanent cams have sticky 3M mounts. The key feature to look out for is Wi-Fi smartphone connection, this makes it so much easier to view, download and share footage. There's also gimmicks such as lane departure and forward collision warning – while these are potentially interesting inclusions, in practice, they don't work very well, so shouldn't sway you're buying decision. One feature which isn't a gimmick is GPS – this allows the car to record your speed and direction of travel, which could be used as extra evidence in an insurace case. It's also important to note, that while these are battery powered, we've found they all have minuscule, sub-thirty minute battery lives. That means they're going to require a power cable. All companies include a charger that plugs into your car's cigarette lighter, while some offer kits which allow you to hardwire the dash cam into your car's fusebox. This excellent dash cam from Garmin more than justifies it's asking price, thanks to its quality footage, number of extra features, and actually quite attractive design. It's the most compact camera here (so takes up less windscreen space) and resembles a GoPro, making it the most attractive as well. That might seem like a funny thing to say, but it won't look out of place in a Range Rover or Mercedes, others on this list will. Despite being small the Garmin 55 manages to pack in plenty of extra features, such as GPS and smartphone integration with the Garmin Virb app. This is pretty slick, as it's the same app Garmin uses for its action cameras. There's also Lane Departure and Forward Collision warning, as well as Speed Camera warnings. The former two are somewhat less useful than the later. We just turn them all off. The video footage is great as well. Recording in 1440p, it performed best in the sunlight test, getting the expose just right, and did pretty well in out night test as well. The video quality might not be as good at the 4K Nextbase 612GW, but it's good enough. The mount is the best designed here, with a small 3M magnet mount making removal and placement of the dash cam incredibly easy. The only downside is the slightly fiddly menu system, which is controlled by four buttons on the side. It would benefit from a touch screen. It's a very good dash cam with some very useful features. Clearly, this has been developed using expertise from other parts of Garmin's business, which is a good thing. It even comes with an 8GB microSD card so you're ready to start recording when it arrives. NextBase are another major player in the dash cam market, and the company's latest device, the 612GW, is their best yet. First of all, NextBase has really improved its build quality, replacing plastic with aluminium. Secondly, we'd say it has the best image quality of any dash cam we've tested, thanks to the 4K Ultra HD Resolution, seven-element lens, Sony Exmor R sensor, and polarising lens (which helps reduce window glare). It was only let down when driving towards the sun, where it would underexpose the roads and other cars. This can be fixed, however, as NextBase gives you exposure compensation control. In other conditions, image quality is excellent, and the most detailed we saw. You also get all of the useful features from the Garmin, including Wi-Fi and GPS, without the more gimmicky features. The mount is suction and magnetic, making it easy to remove and place the camera. There are a few things that let it down, however. Svelte this is not, it's ones of the chunkiest dash cams we tested (taking up much more windscreen real estate than the Garmin). When using it you're also hit with a tidal wave of beeps and chimes. It's not a major issue, just slightly annoying, and makes it seem cheaper than it is (these can be turned off). While the NextBase has Wi-Fi and a companion app available on the Google and Apple app stores, it's worth noting it only has two stars. We didn't have any major problems with it, but other people seem to have connectivity issues. Hopefully this can be fixed with a software update. All-in-all it's a very good dash cam with excellent image quality, a number of useful features, and no gimmicks. There's also the NextBase Ride, which is a dash camera specifically for motorcyclists. 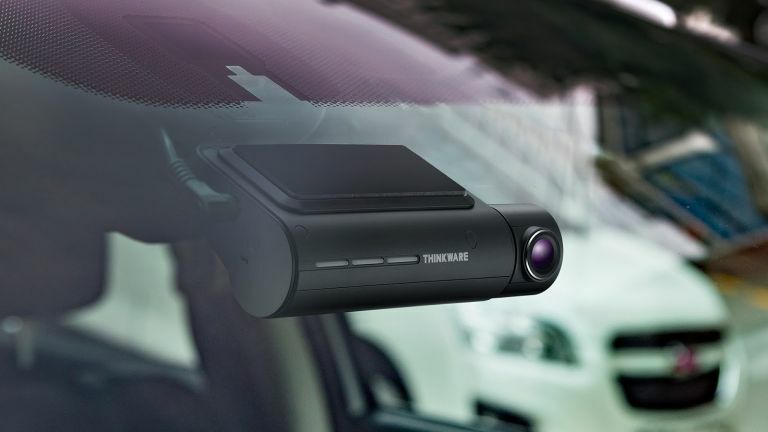 The Thinkware F800 is probably the dash cam that we've used for the longest amount of time – mainly because it's so low profile you just forget about it (which is kind of what you want with these devices). The F800 is fixed to your car windscreen with sticky 3M tape, and, as there's no screen, you can essentially hide it behind the rear view mirror. We think that's the best place for them. The F800 comes with GPS tracking, lifetime safety camera and speed alerts, as well as Safety Warnings such as forward collision and lane departure awareness. Although, while these are marginally useful on dash cameras with screens, they are zero use without a screen. The HD video quality is good, and the night mode (now on its second generation) is very impressive (it's surprisingly sharp and there's next to no noise). There's built-in Wi-Fi so you can connect to your smartphone, although, we did experience some connection issues, and it looks very dated. Time Lapse Mode which records your parked car for 48-hours. That's great if you're worried about the vehicle being vandalised while left at night. That final feature requires the camera to be hardwired into the car. We think that's what you'd want to do with the Thinkware. It's not too difficult and also the neatest looking option, freeing up the 12V port. The most interesting capability bundled in with the F800 Pro is Thinkware's new Cloud service. This includes the ability to get notified when your car leaves a geofenced area, or when an impact occurs to your vehicle. You can also use it to locate your vehicle when parked. These are potentially very useful features, but we found it very difficult to get them working, and from reading other online reviews, we're not the only ones. The Mio MiVue J60 is a really neat little device, with a compact body which manages to squeeze in a lot of technology. It's the sleek design that's key here, as the shape of the camera and small mount means it'll sit discreetly behind your rear view mirror. Despite its small size, the MiVue J60 has a sensor capable of capturing sharp 1080p footage at 30 frames per second with a wide 150-degree viewing-angle. It's got a dedicated night mode as well, which ensures registration plates and small details are captured in most lighting conditions. The J60 not only captures clear video; it also features Wi-Fi, for video playback and updating camera settings via a smartphone app; as well as GPS, which tracks your vehicle's location and speed. The MiVue J60 is packed full of safety features (although, you know what we think about those) including Advanced Driving Assistance System, Lane Departure Warning System, Forward Collision Warning System and Fatigue Alert. If you decide to have these on (they can be turned off through the app) the dash cam will emit a beep if you start to drift over road markings or go over the speed limit. The device also comes with safety camera data, and free data updates for the lifetime of the device, so drivers can avoid any dreaded speeding fines. That's potentially very useful, depending on your driving style. A great Full HD dash cam for less than £100! If you want to test the dash cam waters before jumping in, this affordable model from Mio is a great place to start. The MiVue C330 will begin filming in 1080p at 30 frames per second as soon as you start your car. Video quality is good, although, obviously not as good as the more expensive options on this list. The C330 comes with plenty of extra features, including safety camera warnings and built-in GPS tracking. That's particularly impressive, given the price. The only thing that really lets this camera down is the night mode – it's not great, so if you a lot of night driving this one isn't for you. A discrete dash cam with a screen – it's affordable too! We must say, we love the design of this compact dash cam from YI. It's probably our favourite form factor out there. You mount the lightweight camera to your windshield using sticky 3M, and once in place it's incredibly discrete and subtle. This type of design doesn't usually include a LCD screen, but the YI features a 2-inch screen which is useful for reviewing footage, and and east to hit record button. The quality is fine, capturing a 140° wide-angle image in 1080p at 30 frames per second. If you need to provide detailed recordings of collisions that can be viewed at any time through the YI Dash App. While Philips may be better known for making electric toothbrushes than dash cameras, it doesn't mean it can't have its finger in more than one pie. The catchily named ADR81BLX1 ADR 810 impressed us with its clear screen and decent image quality. It even has something we've not seen on a dash cam before - Driver Fatigue Warning. Could be a useful feature, could also have the potential to be annoying. A few things let the Philips dash cam down. First is that is has no internal battery what so ever, so as soon as it unplugged it dies (after saving the footage). Most of these have backup batteries, so they keep running for a bit longer. The second is the build quality, it's not what we'd expect from a Philips product. These are minor quibbles though, and at the end of the day, the Philips dash cam produces decent 1080p video and is very easy to operate. The RAC 05, just like the Garmin Dash Cam 55, is one of the most fully featured we've seen. In fact, the RAC 05 matches the Garmin in almost every area, with GPS tracking, lifetime safety camera and speed alerts (in over 80 countries), as well as forward collision and lane departure warning. The three areas where the ProofCam falls behind the Garmin is that there's no Wi-Fi and smartphone companion app (which makes getting footage off slightly more difficult), the mount is suction and not as well designed, and it's a more intrusive design. You see we're nit picking there, so if you can pick up the ProofCam RAC 05 for significantly cheaper than the Garmin, it's probably worth going for this. We were super impressed with the image quality of the RAC 05, it was our pick of when it came to recording at night. The benefit to the larger design is that there's space for a larger screen. This makes viewing video on the device more pleasing. Just like the Garmin, this dash cam also comes with a 8GB microSD. The cheapest, smallest unit here, the 112 packs a 120-degree camera and smart brushed-metal detailing. The two-inch screen is fiddly in this touchscreen era, rivals have sharper images, and extremes of light and shade throw it a little, but the 112 does the job and records to the 32GB SD card in three-minute chunks. There’s also a mic, and a battery for 30 minutes of post-smash recording – the camera doesn’t switch off when the car does. Consider that a dash-cam is for emergencies, not something you interact with daily, and the 112 is a great budget choice. The DriveAssist 51 is both a dash-cam and a sat-nav. The five-inch screen lets you check the camera position, and there’s a 4GB card to record onto, either all the time or in the event of a smash. Footage is high-quality and saved in one-minute chunks. Time, date, speed and location are included (each of these can be turned off), as is a microphone, providing you vital screechy information. There’s also Bluetooth, and driver-assistance features such as lane-departure and forward-collision warnings, while Go Alert tells phone-gawpers that the traffic’s moving. The RoadHawk Vision looks a little cheap, but its compact design packs some nice tricks. There’s no screen, but Wi-Fi means you can use the free app to check the camera position on your phone, and also watch your favourite crashes – though rivals do this better. The 160-degree, 5MP camera gives a great view of junctions – most are 120-degree – and its images are crisp. Constant-loop recording means you never miss a thing, and ‘event’ clips are saved to a folder on the 8GB card. Speed and location aren’t shown, but you get a mic for some ‘I’m Ronnie Pickering’ YouTube gold. The CDR 900 E gets off to a great start with a smart, sturdy body and some premium detailing. The 160-degree lens, 3MP camera and 1296P Super HD recording translate to high-quality footage with a great field of vision, and linking to your smartphone via the Wi-Fi and reviewing footage on the free app is a cinch. There’s a lot to like about the CDR 900 E, but it lets itself down with a faffy interface and a microphone that sounds like you’ve hung it out of the window. That it costs so much yet can’t record speed or location has it spinning out of contention. These are a selection of the best dash cams available in the UK, they all automatically record footage when they sense a collision, but some of them have a few extra abilities thrown in. They're certainly a worthwhile investment (especially in the winter), and could end up saving you a lot of money, either in the event of an accident, or in insurance premiums (for example, some companies will give you a 15-percent discount car insurance with most of these cameras). There are several things to consider when buying a dash cam, but the most important factor is image quality. These devices are absolutely pointless if, when it comes to reviewing the footage of an accident, it looks like the lens has been smeared with Vaseline and you have difficulty telling whether you were cut up by a grey Vauxhall Corsa or a baby elephant. We enlisted the help of a brand new Land Rover Discovery to throughly put these dash cams through their paces. Testing all of the cameras with the same lighting conditions, in a number of different, challenging scenarios, such as driving towards the sun and at night. If we weren't happy with the image quality, they didn't make it in this list.